Most Americans know they need to prepare for retirement but are often unsure of what they need to do. Unfortunately, being clueless in the years preceding retirement is having a negative impact on many seniors entering retirement today. Studies show a shocking number of Americans are either living with their children or in extreme poverty because they had no retirement savings. According to the National Institute on Retirement Security, the median retirement account balance for working-age households across the United States is $3,000. The savings is a shade higher and even more concerning for those nearing retirement at $12,000. The picture is even more grim for at least one-third of Americans between the age of 50 to 65 that are barely meeting the demands of their current lifestyle and have nothing saved for their retirement. 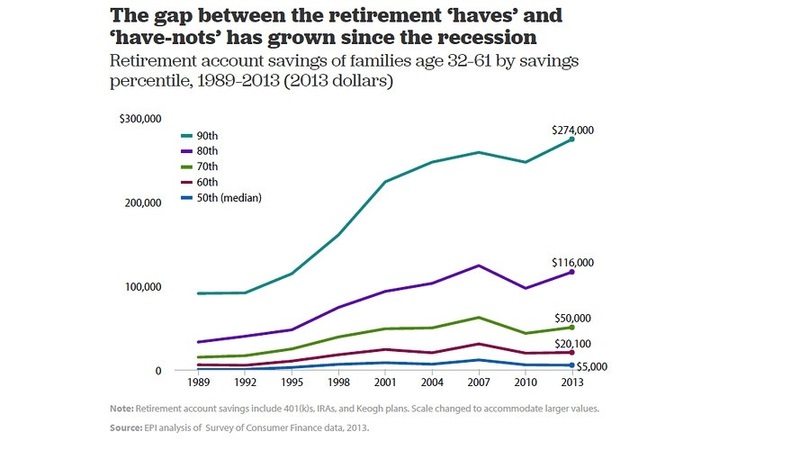 Based on a CBS News poll, an estimated 70% of working Americans said that the high cost of living and expenses of daily life makes it difficult to sock even a nominal amount in saving for retirement which help to explain the gap between the those with retirement savings and those without. Being proactive about preparing for retirement, is one way to start closing the gap. Sadly, it not so much about being able to travel or maintain a hectic social life during retirement as it is about staying above the poverty level or maintaining some semblance of independence. This dismal picture however, can improve if these late starters are willing to implement some lifestyle changes and get serious about saving. Also, the retirement dilemma of baby boomers has spurred millennials to start saving earlier so that they can enjoy a comfortable lifestyle and be self-supporting for the duration of their retirement year. One way to avoid the uncertainty of retirement is finding out what you can do now to start preparing for retirement. Whether it starts early or late, retirement planning is an important step that can ease the uncertainties of a future with little or no financial resources. What is your current income versus expenses? Do you have any obvious money leaks that you can immediately plug up? How many years can you reasonably expect to continue working based on your health and marketable skills? Are you able to channel any unnecessary expenditure such as money spent on dining out twice a week into a retirement saving plan instead? What would happen if you were suddenly unable to work? Is it possible to find other income streams that can be applied towards retirement savings? Answering these questions can help you to determine how much, if anything, you are able to start saving towards retirement. Talk to a financial planner who can help you to explore all your retirement saving options and set-up a retirement saving budget and fund allocation. Note: This is just an example portfolio for illustrative purposes only and should not be deemed as investment advice. Your personal portfolio may or may not include these asset classes. Find out what your Social Security benefit will be at your expected retirement age. Explore all your potential pension income from a defined benefit plan, previous employers and your spouse or partner. Explore your options for work during retirement and work on improving your marketable skills before you reach retirement. Begin researching how much you will realistically need to live on during retirement. This can open up various options that you may not have considered such as relocating or other innovative ways to subsidize your income. Create a realistic financial action plan with reasonable cost of living projections. Some financial advisers recommend that you compare your expected income in retirement to major expected costs such as medical bills, supplemental insurance and housing expenses that you will have in retirement and create a budget based on what you'd like to live on. The closer you get to retirement the better you will be able to determine how much you will actually need or can afford to live on. No matter how much you are able to save towards retirement, having a plan is the best way to prepare you to make the shift into retirement. With a well thought out retirement plan you will know your limitations, be better able to maximize your options and be prepared to address issues as they arise. If you are not sure where to begin, the first step is to open dialogue with a certified financial planner who can help to tailor a plan for you based on your individual set of circumstances.